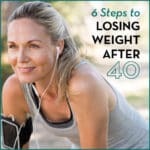 Need to lose weight faster? There are a few simple weight loss hacks you can use at home, at the office, or out on the town to boost your weight loss and help get the body you deserve. Try a few or try them all to encourage healthy weight loss. Eat by a window. Whether you are dining at home or eating out in a restaurant, studies conducted at Cornell University have shown that if you dine near a window, you’re likely to eat healthier food. Put high-fat foods in hard-to-find places. If you keep unhealthy snacks in your home, make them hard to reach. Use the top shelves of your cabinets or very low shelves behind heavy pots. Choose meal companions carefully. According to research, you’re likely to make food choices based on the behavior of the people that are with you when you eat. So choose healthy friends to share your meal. Never dine at your desk. Tempted to stay near your computer and work through lunch? Don’t do it! Your meal will be less satisfying and you’ll be more likely to want more food soon after. Eliminate economy-sized packages. When you serve yourself food from huge boxes of cereal, chips or crackers, you’re more likely to overserve yourself. Get sneaky with labels. Can’t ditch the snack foods completely? Label your favorite food packages with the correct portion size of that snack AND the amount of exercise needed to burn it off. Learn to pour perfect portions. Wine is fine, but learn to drink the right amount. Use a measuring cup to pour a five-ounce serving and then pour the wine into your glass. After a few tries (over several days), you’ll know exactly how much to pour. Clean out your fridge. A clean refrigerator can showcase your healthy foods to make diet-friendly eating easier. Put single-serving containers of Greek yogurt, low-fat dairy products, and chopped veggies on the front shelves, so you see them right away when you open the fridge door to browse. Use photo apps as a food diary. Not every dieter counts calories. But you can still keep a food diary to hold yourself accountable and to promote diet-friendly choices. Use Instagram or Snapchat to broadcast and brag about your healthy meal. Say “sayonara” to your microwave. Quick microwavable meals are often high in calories, high in fat and low in nutrition. Fill your microwave with books, dishes or get rid of it altogether to inspire healthier cooking and eating. De-clutter your countertops. Clean living encourages clean eating, according to scientific studies. Clear off your countertops to give yourself the space you need to prepare healthy meals. Eat before you shop. Never go to the grocery store hungry or after a hard exercise session. You’re more likely to choose diet-friendly foods if you roam the aisles with a full belly. Enjoy a post-meal mint. Peppermint and other minty flavors help you to stop eating. Chew gum after dinner or brush your teeth to derail post-meal snacking. You can even buy MealEnders to help you eat less. Unplug to practice mindful eating. Avoid distractions at mealtime. Turn off the television and walk away from your computer when you eat to avoid mindless eating practices that often lead to overeating. Choose a single indulgence. Drink wine with dinner or enjoy a small healthy, dessert at special dinners, but don’t do both. Bargain with yourself and choose the indulgence that makes the meal most satisfying for you. Pack lunch after dinner. Prepare tomorrow’s lunch after dinner tonight, when your belly is full, and you feel satiated. You’re likely to pack a smaller meal with fewer calories. Wear a waistband. Ditch the sweatpants and loose, comfy, clothing during meal times. Wear something that has a fitted waistband. It will help you to feel when you’ve had enough to eat. Drink water with meals. Skip sodas, juices and even wine with most meals. Drink water instead. The swap will help you to focus on and enjoy the satisfying flavors of the food on your plate, and you’ll cut calories at the same time. Delegate dishes for diet success. Don’t linger in the kitchen after your meal is over. You’re likely to mindlessly nibble and potentially overeat. Go for a walk, and if possible, delegate the dish-work to a loved one who supports your commitment to reach a healthy weight. Go low at the grocery store. Many of the healthiest (and cheapest) foods in your grocery store are not at eye level. Look on the bottom shelves for foods that are often less processed, less expensive and usually lower in calories. Fill up on fiber at lunch time. Make sure you include fiber-rich foods (a pear, raw broccoli or radishes) in your lunch. The fiber will help you get through those late afternoon cravings that can undo your diet. Drink a full glass of water before coffee. Before you enjoy your favorite coffee shop treat, drink a full bottle of water. We often overindulge in high-calorie java treats because we’re dehydrated, not because we need the caffeine. Split your meal into courses. Dine like you’re at a restaurant even when you’re at home. First, serve your salad on a small plate. Then, enjoy your entrée on a separate plate. Don’t leave large serving bowls on the table. When you take more time to eat, you give your belly a chance to recognize the signs of satiety. Then you’ll eat less and feel more satisfied. Choose smaller, brighter plates. Some research suggests that eating off of smaller plates and plates that are brightly colored may help you eat smaller, healthier meals. Give yourself credit. Dieters who believe that they can lose weight are more likely to reach their goal. So acknowledge at least one success each day and write it down or say it out loud. 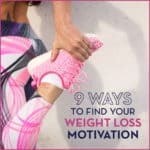 It’ll boost your motivation, your commitment to your program and your chances of weight loss success. Why Cheat Days Are B.S.